The January General Meeting held at Windermere Town Hall was well attended. We had a full agenda with a wonderful presentation by Merle DeLand, Vice President of Tampa Bay Begonia Society and a visit from the UCF students who received WGC’s horticultural scholarship. If you missed this meeting, you missed some great information on Begonias. Merle DeLand told us everything we need to know about begonias and sold several different varieties for $5 each. Some valuable tips I learned is that they thrive in humidity, cooler temperatures and they must not have wet feet. They don’t like our hot summers, but they will do well outside if placed next to a pond waterfall or fountain and in shade, of course. After the presentation, members enjoyed a short break with refreshments provided by members Denise Harbin, Carol Wolfe & Carolyn Gross. Next, the recipients of the Windermere Garden Club Horticultural Scholarship, Sheila Scolano and Jules NeSmith, told us about their studies and projects. They were accompanied by their advisor, Amy Alexander. After the meeting, members of WGC took the students out to lunch at Westerly’s Restaurant in Metro West. November 14, 2013 general meeting was very interesting. Becky Nix, a resident of Windermere, spoke on her nighttime “moon” garden. She spoke about how her garden changed over the years with her lifestyle by using photo slides of her garden and other similar gardens. She also had a large list of the plants that have done well in her nighttime garden that bloom or show up well at night. 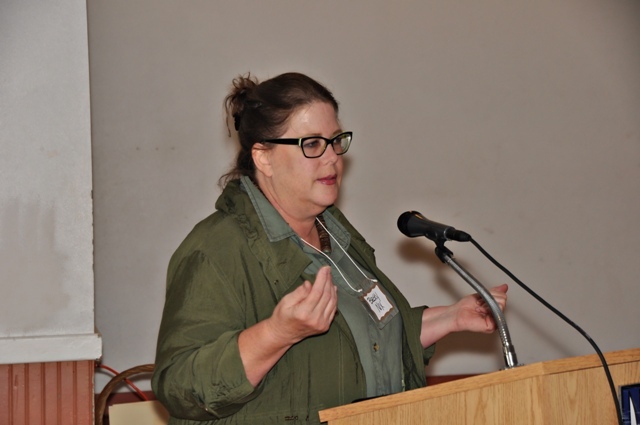 Our speaker, Becky Nix, was great. A great job by our hostesses! Our first meeting of the 2013-2014 year kicked off with our usual first speaker, Tom MacCubbin, Florida Gardening Expert and host of many Central Florida shows and articles. See links to Tom’s websites at the end of this post as well as photos provided by Club Photographer, Donna Ditges. Hostesses Cannon Stoffel, Bonnie Baum and Peggy Collins provided wonderful snacks of deviled eggs, sandwiches, orange cake, fruit and coffee, juice and tea. Thank you, Ladies. It was delicious and above-and-beyond. PROGRAM: Tom’s topic today was ”Eco-Friendly Treatment of Garden Pests and Diseases,” accompanied by a very informative handout “September in the Garden 2013” (click here to download as a pdf). He also added a trivia contest and gave several door prizes for correct answers. The winners of the door prizes were Angela Withers (gardening book), Carol Wolfe (garden hat), Joan Prasky (flower pot of goodies) and Anne Theiss (garden theme notecards). 50/50 DRAWING: This month we had a plant from the hostess table entered into the drawing. An arrangement for give away is not a requirement of hostessing; this was an unexpected addition. Joan Prasky won the beautiful bromeliad hostess centerpiece. SMART PHONE APP FOR THE GARDEN TIP: Vice President, Jill Thompson, had a very interesting tip for us. There is an app for smartphones that will help you with your gardening. It is called “Beesmart”. Just search on your smartphone for the app. It will help you decide on plants for your garden, i.e., search your zip code, then amount of light, then amount of water, then shrub, tree or plant; then flowering, etc. You get the idea. GREAT TIP JILL! Joan Prasky and Maureen Tuber will be hosting a one day flower arranging class. Details have not been decided yet. Check the website often for the latest developments. Beginning October 2013, everyone is encouraged to bring their plant cuttings or new plants they have started to the monthly meetings. These plants will be left at the front door for anyone to take. We suggest leaving a $1 donation that will go to the Garden Club. There is no requirement to bring a plant to exchange … there are plenty of members who have more than enough they would rather give away than throw away. You know how we gardeners are. Request that you bring any plastic nursery pots to the meetings. Many members need them to start new plants. Better Lawns & Gardens streaming radio show Tom MacCubbin has hosted the “Better Lawns & Gardens” radio program for more than 15 years and is heard every Saturday morning on more than 20 radio stations throughout Florida. The Windermere Garden Club meeting today was mostly discussing our annual Crazy Card Party (“CCP”) planning. The CCP is be held on March 14, 2013 at 10:00 AM at the Windermere Town Hall. 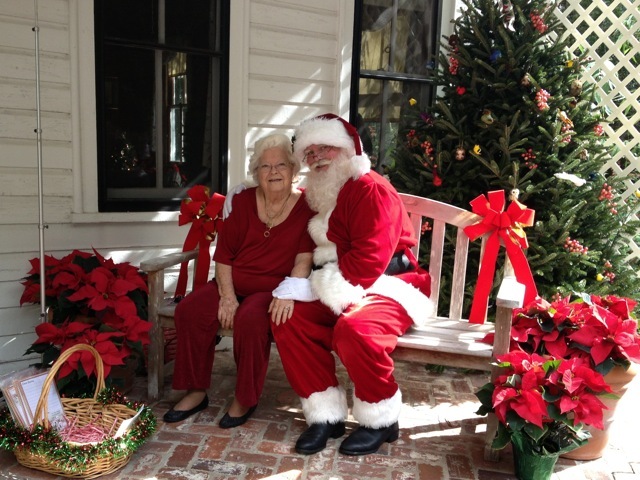 The Windermere Garden Club December General Meeting was informal and held at Westerly Restaurant at Metro West Golf Club. The food was delicious and lots of comraderie with friends was enjoyed by all. Enjoy the photos courtesy of Club Photographer, Donna Ditges. Click on photo to enlarge. 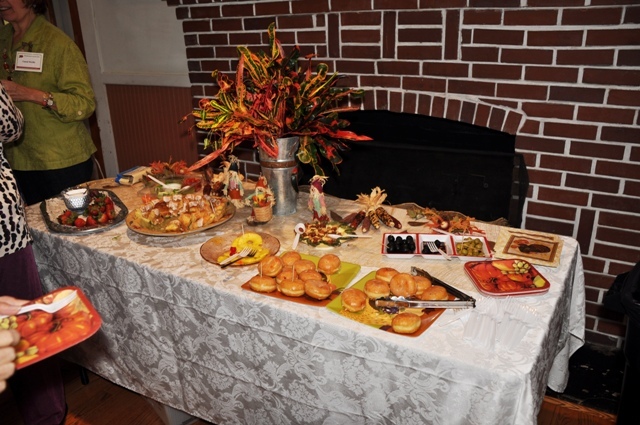 The Windermere Garden Club general meeting was held at Windermere Town Hall on October 11, 2012. 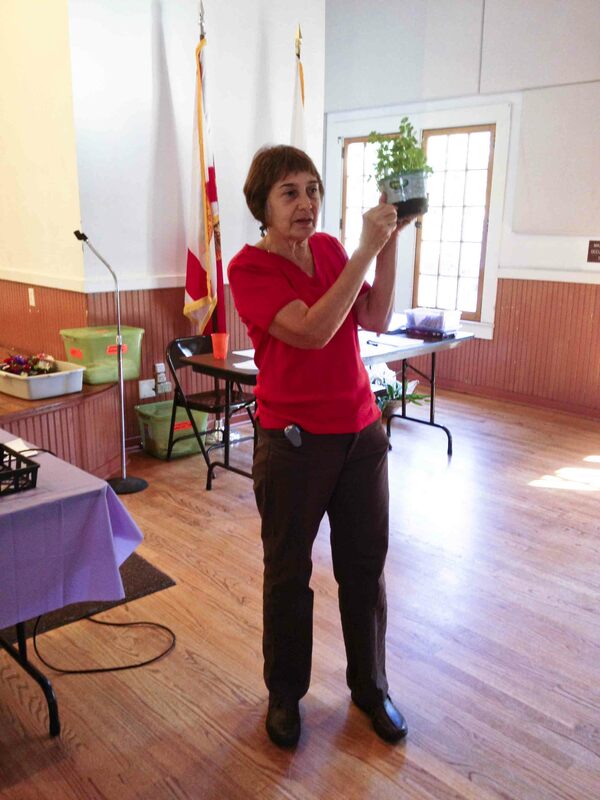 Our guest speaker, Dena Wild, Master Gardener, gave a very informative presentation on Cool Weather Herbs. TIP: Did you know you can lay a piece of cardboard in the garden (the back of a cereal box will do) to catch pesty snails? You must do “snail patrol” every morning. Dispose of the snails by scraping them into a bucket of soapy water to drown them. We also had our bi-annual “White Elephant” Sale. Members bring items from their homes to sell with proceeds going to the Garden Club for club projects. Refreshments were provided by Joan Yancey, Clare Durante and Linda Gidel. Photos below are provided by Donna Ditges. 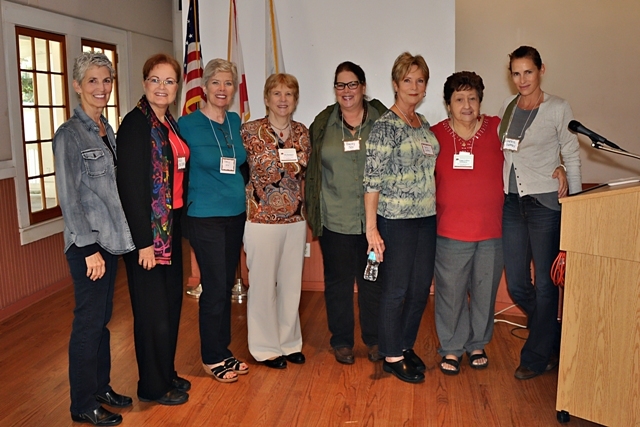 The 2012-2013 first meeting of Windermere Garden Club was held on September 13, 2012 at our regular meeting place at Windermere Town Hall. Tom MacCubbin, Florida Gardening Expert, was our guest speaker, and as always, gave a very entertaining and enlightening presentation with valuable gardening tips. Member, Angela Withers won the door prize provided by Member, Teresa Myers. 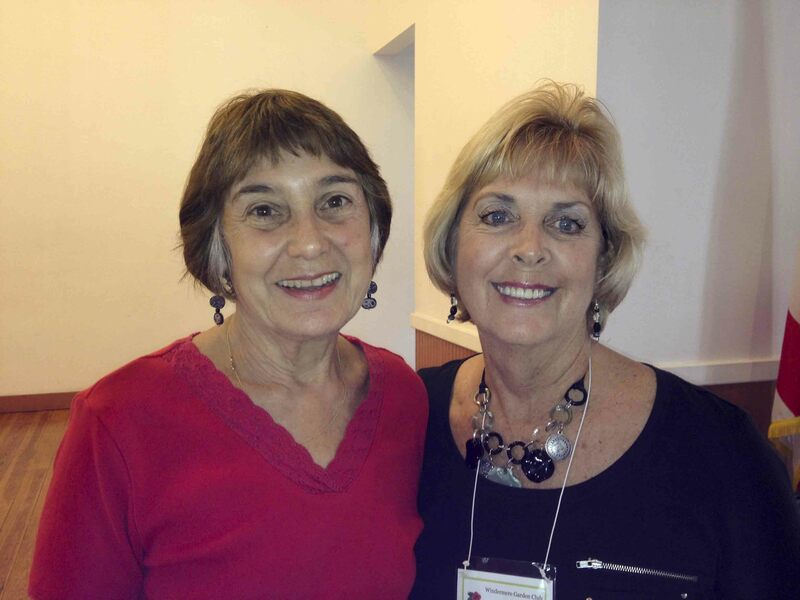 Refreshments were provided by Members, Carolin Warren, Minora Hand and Elizabeth Rizzi. All photos in the slideshow below are provided courtesy of 2nd Vice President, Maureen Tuber.